"Leading The Way in The USA..."
Be it as one of the North American Sand Soccer Championships' 160,000 returning sand soccer "veterans", or perhaps a newcomer to this site in search of information on this emerging beach sports craze, welcome to the exciting world of soccer on the sand and beautiful Virginia Beach, Virginia, USA! If you enjoy sun, sand and surf with your soccer - this IS the place... and get ready for Ultimate Beach Ball! 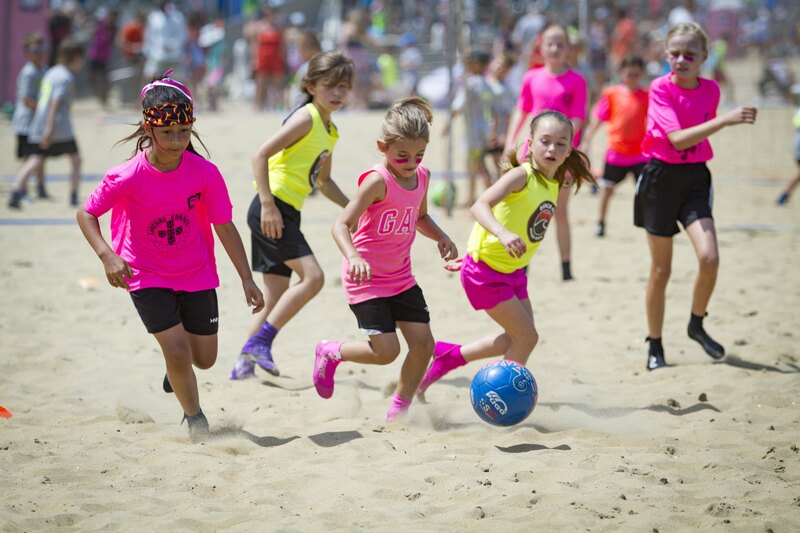 You’ve just connected with the globe’s premier single-weekend sand soccer festival as 11,000+ players will rock the Virginia Beach oceanfront June 7-9 when the 26th edition of the Championships returns to one of the nation’s top resort cities. You’ll find colorful international teams parading to the sound on conga drums enroute incredible U.S. Open/ProAm matches, with cash prizes at stake; hundreds of youth teams aged 8 thru 19 battling on the beaches, men’s and women’s single gender squads, college teams, and ever-increasing "corporate-coed" competitors from businesses and military organizations promoting health and fitness. The game, played on 25-35 or 30-40 yard grids, is 5v5 and fast-paced, with limited dribblin’ and an average of 60 shots on goal. Never fear, however, as over 80 brackets are seeded to support all levels of play - from the beginner to the most professional. Much like beach volleyball, sand soccer‘s rules are easy to pick up. Uniforms for this beach bash are "anything-goes". One of NASSC's special affiliations is with operational arm, Beach Soccer Worldwide (BSWW), to execute the sport of beach soccer at the professional level worldwide. The organization has supported NASSC in attracting top international professional entries and conducting youth camps in Virginia Beach. This "World Cup" equivalent of international amateur beach soccer events is hard to miss and attracts teams from all over, including nearly 20 states and entries from as far away as Africa, Portugal, Germany, Brazil, Norway’s rocky seacoasts, the Caribbean, and the wilds of Canada's Northwest Territories. The Championships are staged over 25 full City blocks of prime oceanfront real estate, on over a mile and a half of white sand - against a backdrop of diving gulls, banners waving in stiff ocean breezes, thousands of Boardwalk bedazzled spectators, live music and great food. Meanwhile, surf’s up just a few steps from the soccer action and, when day is done, most participants and fans head out to the resort’s unbelievable lineup of region entertainment. The Hampton Roads Soccer Council (HRSC) and its affiliates are your host for the tournament weekend and plans year-round to ensure a guaranteed sand-blast. HRSC affiliates include: Beach FC, Over Thirty Men's Soccer League, Southeastern Virginia Women's Soccer Association and the Virginia Rush. HRSC has staged the Championships since 1994 to both promote the sport of beach/sand soccer and generate revenues for its premier 75-acre Soccer Complex. Over 140 national and regional sponsors and advertisers graciously support the festival. New corporate teammates are always welcomed and may view our sponsors page or contact us for more information. Conventional outdoor soccer enthusiasts make up the bulk of competition. Once you’ve experienced soccer in the sand, you’re hooked big-time and a huge 93% players and families return year after year to make the North American Sand Soccer Championships their "Summer Kickoff", or a reward for a just-completed school year or Spring soccer campaign. Want more info? Then click thru this website and see what participants have said over the years about this fantastic festival. Meanwhile, visit us on Facebook (@nassc.hrsc) and Instagram (@sandsoccer_nassc) for additional background and photos. The tournament is first come-first in by date of receipt of online application and entry fee. The single exception is the Pro/Am division where entry is based on team composition and history and additional entry material is forwarded by the tournament to those Pro/Am teams showing interest in entering the men's U.S. Open. Beyond the men's pro division U.S. Open, other beach sports tentatively scheduled include Beach COED Flag Football, and Sand Hockey. Each of these special competitions will bring additional beach sports excitement to the Oceanfront for participants and spectators, while further enhancing the "beach games" festival atmosphere of NASSC. JOIN THE BEACH SOCCER EXPLOSION - GAME ON! !